Hi Paul, thanks for posting. You write, “I'm incredulous that you attribute to me what I do not hold (e.g., that Mt. 15:3-4 is in force today).” I can certainly sympathize with that, as no one likes to feel misrepresented. However, I'd like to submit that, while difficult and uncomfortable, this could perhaps actually be good in that it allows us to really face what is at stake in the discussion. I note that in your conversation with Greg, when he brought this up, you did not acknowledge that the idea of a command to execute children really troubles you, too. Perhaps it does, but you did not communicate that distress and struggle. You instead stressed (as you did again in your comment here) your view that “Jesus clearly seems to take this as divinely commanded under the Mosaic Law.” This left me with the impression that you had no problem with it since you believe Jesus endorses it. Or at least that, for you, the issue is not really whether or not you or I struggle with something as being alarmingly immoral, but simply whether it is commanded. To state things differently, the issue is not that I am claiming that Paul Copan is endorsing such behavior today. I fully acknowledge that you do not, and if I implied otherwise, that was sloppy of me, and I apologize. The issue, i.e. what I am wanting to bring to light here, is that you are endorsing such behavior as morally justifiable if and when God commands it. Indeed, if the reason you are not following this command to execute children is simply because it happens to not be in force today, and not because you think it would be morally abhorrent to do so, then you really should not feel incredulous. It would only make sense to feel incredulous if I claimed you endorsed something that you found morally abhorrent. My suspicion however is that the reason you felt incredulous is because you actually do find it morally abhorrent (I mean seriously, who wouldn't?). I think it would be helpful if you could acknowledge that. Throughout your conversation with Greg I was waiting for something like that from you. He kept bringing up really troubling things like divine commanded genocide and so on. I never heard you say “Yes, Greg, your reaction is valid. I really struggle with that, too. Here's how I try to understand it, which is a bit different from how you do...” Instead your responses all seemed like none of this troubled you, like a tennis player volleying back every shot that comes over the net. Like it was a game of sorts. Again, perhaps this all does in fact trouble you, but I saw no indication of this. To be clear, my wish that you would acknowledge and validate much more than you do the legitimacy of people's shock and moral outrage in regards to these examples of divine commanded killing of children and infants is not so much about the merits of your arguments, and has more to do with effective communication. It just works better to validate others' views and feelings--especially ones that are deeply morally troubling--and makes it more likely that they will be open to hearing yours. I think the lack of this, both in your books and interviews, is what leads me (perhaps incorrectly) to conclude that you have no moral problem with any of it. The impression given is that while immature Christians might struggle with such things, you demonstrate the model of the one who has it all figured out, the model of faith as certainty as an antidote to doubt. I would submit that when people are troubled by such profoundly immoral commands, it does not represent a weakness in their morals or faith, but instead is the result of adopting the heart of Jesus. That is, such moral doubts spring from developed empathy which in no way should be regarded as being in conflict with faith. To be fair, you do speak theoretically of how we might find certain actions “troubling,” but this is in the context of arguing that we should do it anyway if it is a command. This brings me back to what I see as at the heart of the substance of your argument: The issue of making commands the sole criteria for moral evaluation. You make the point that there are some circumstances where it is morally justifiable to use coercive force. I fully grant that point. I can think of lots of examples myself. That, however, in no way means it logically follows that therefore it was okay to execute children for being disobedient or slaughter infants. The moral justification I believe you would give for both of these is that they were divine commands. As you say in Is God a Moral Monster? “Without God’s explicit command (and thus his morally sufficient reasons), attacking the Canaanites would not have been justified” (169). Again, the sole moral justification here is simply that it is a command. We don't know God's reasons, we just know the command. This is what I term the hermeneutic of unquestioning obedience. You say that you seek to approach the OT as Jesus and the apostles did, but I don't think you actually are. Jesus taught his followers to not follow certain OT commands, rejecting the command “an eye for an eye” and teaching them instead to follow his way “but I say...” Paul told his churches that they were not under the law, i.e. not under commands, but under love. Jesus, when told that the law commands a woman be stoned to death, opted to disobey that command, and instead forgave her – which under the law there was absolutely no provision for with the sin of adultery. I could go on for pages and pages with examples of this, and if you are interested, I in fact do in my book Disarming Scripture. The bottom line here is that both Jesus and Paul consistently approach faithfulness to Torah as being expressed not in blindly following the command, but rather in seeking to do what is loving and good and just – even if that meant going against a command. That's why Jesus was regarded by the authorities of his own religion as a lawbreaker. He prioritized the welfare of people over commands and laws. That's why he broke the Sabbath. That's why he touched the unclean (by law making himself unclean). That's why he fellowshipped with the “woman of ill-repute.” His understanding was that the purpose of the law was to lead us into loving action, and if in practice it turned out it was not leading to this, then our application of the law needed a course correction. As Jesus says “People are not made for the Sabbath, the Sabbath was made for people.” Likewise, the law is intended to be a means to help us to love, not something that binds us into doing things that are unloving and immoral. That's how I see Jesus and Paul's approach to the OT, and so I try to take that same approach with all of Scripture. I hope from this is is apparent why I maintain that the way Jesus and Paul both interpreted and applied Scripture was the opposite of the hermeneutic of unquestioning obedience, and thus why I take such issue with your approach to Scripture. I think these conversations are very important. I believe myself and others have much to benefit from them as beliefs about God are at stake. I agree that there are Christlike ways to disagree. I also agree with Derek that we must question others’ views if we understand them as damaging God’s reputation. I think it is very appropriate to understand what God is like both from a biblical interpretative viewpoint as well as from a personal moral intuitive viewpoint. Isn’t something up if they are different? I believe truth in general and Scriptural truth involves the same source – the Spirit (John 14:16). I am convinced moral human rationale to discern truth is not godless. 2. Did Jesus suggest or imply all OT laws endorsed by God were perfect, or did Jesus sometimes suggest better laws? Derek, thanks for your reply and clarifications. There’s much to say here that could get quite involved! Au contraire, I most certainly do acknowledge that we are dealing with difficult questions. Ironically, in the radio interview you commented on, my very first statement in response to Greg (at 9:35 into the program) is this: “Greg is right in saying that these are problem passages; there are no easy ways to navigate through them. And I appreciate Greg’s undertaking this conversation….” Just after that I mention “troubling texts” (10:24). In addition, I write in my Moral Monster book: “For anyone who takes the Bible seriously, these Yahweh-war texts will certain prove troubling. This issue is certainly the most weighty of all Old Testament ethical considerations. We should not glibly dismiss or ignore such questions” (p. 188). In my coauthored book with Matthew Flannagan (Did God Really Command Genocide? ), we that “we should think more deeply about difficult, ethically troubling Old Testament passages rather than gloss over them” (p. 41). 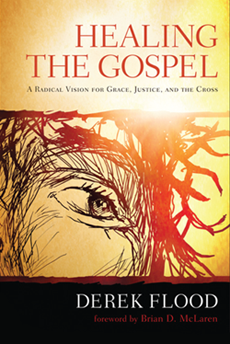 In my review of Greg Boyd’s book, I write: “Without question, the OT presents us with morally challenging passages.” So I’m certainly on record for saying such things. We should take seriously the views that Jesus and Paul took, which I argue are not opposed to the use of coercive force (which can be used justly or unjustly. 1) Jesus himself uses coercive force when driving out the moneychangers from the temple. Does this go against his turning the other cheek or not resisting the evil person? 2) Paul seeks help from the Roman military when his life is under threat by a mob plotting to take his life (Acts 23). Does this go against what Paul says in Romans 12? 4) Jesus threatens to cast the false prophetess Jezebel on “a bed of sickness” and to “strike her children dead” (Rev. 2:23). Does this go against Jesus’ own ethic of turning the other cheek and loving enemies and “nonviolence”? I could go on, but I would appreciate hearing your response on these questions. First of all, thank you for the examples of where you stress how you too struggle with these passages. That's helpful to hear. In regards to your questions, as I said in my reply above, I fully grant that there are some circumstances where it is morally justifiable to use coercive force. I would even take it a step further and say that there are some circumstances where it is morally justifiable to use lethal coercive force. Now, of course, as I mentioned above, just because one recognizes that there may be some situations where lethal force is justified does not mean that it always is. I think a pretty clear example of where lethal force is not justified is in capitol punishment for children who are disobedient to their parents. All Western societies today would universally view this as appallingly immoral. Same goes for slaughtering infants in war, which would be viewed as a war crime today. That is not something that only pacifists would believe, but would equally be the view of police officers, soldiers, judges and others who fully embrace the idea that lethal force can be justified in some circumstances. Just not in those. Let me take this a step further ethically: While we can find ways to justify lethal force, I would like to suggest that we should not stop with what we can justify. I think we can find a useful parallel here in looking at the issue of divorce. One could easily take Jesus’ words to say that divorce is categorically forbidden. On a low moral level we ask questions of permission and prohibition. So the question here becomes, “Am I allowed to get a divorce or not?” But the deeper and more important question to ask is “What do we need to do to have a good and healthy marriage?” and more specifically “How can we break out of our patterns of hurt and conflict, and restore trust, and the joy, surprise, and closeness in our relationship again?” I know a thing or two about this specific issue because my wife is a licensed psychotherapist specializing in marriage counseling. As a couples counselor she would agree that in some situations divorce is the best option. However, part of her job is to help people to heal their marriages, getting past wounds and hurts, in order to avoid divorce whenever possible. That doesn’t mean staying in an unhealthy marriage, it means working to make the marriage healthy and loving. Similarly with violence, if the question is “can it ever be justified” I will answer: Yes, it can. So can divorce. However, specifically in regards to justifying lethal force, I find the counsel of Walter Wink (and later Glen Stassen) especially instructive who proposed that, rather than looking for criteria for how we might justify violence, it would be more useful if we looked for "violence reduction criteria." For example, while we can see how it could be justified for a police officer to use force, it would of course be preferable (not to mention safer for everyone including the police officer) if that officer was trained in the art of conflict resolution and deescalation. That's the trajectory I would propose the NT pulls us in--away from mere justifying of actions, and towards restitution and restoration. The biggest problem with Copan's way of reading the Bible is it leads to moral ambiguity. For example, someone from the same viewpoint can defend Roy Moore by comparing that "Mary was a teenager and Joseph was an adult carpenter". Basically if evil can be redefined as good arbitrarily then in fact humans do not have knowledge of good and evil. I agree with Mike. I think it is a vital point. God says be like Me by committing no evil. The assumption is we have to somehow know the difference between good and evil. I would suggest we do know based on universal moral intuitions. When intuitions contradict biblical interpretations, I think something is up. Yes I think that really gets to the heart of things. Ethics and discipleship should pull us towards questioning ourselves and our institutions and systems, drawing us to grow morally, challenging our blind spots, drawing us towards being better people. When apologetics becomes a form of marketing "damage control" where the goal is to justify anything bad, rather than face it and seek reform, it takes us in the opposite direction of ethics and discipleship, becoming a means towards developing amorality, it pulls us away from Jesus. The merits of a theology/philosophy/ideology should be judged by the fruits it produces. I think it has become quite clear to most of the world what the fruits of Roy Moore supporting white conservative evangelicalism is. Derek, thanks for your clarification. Good to know. There are, of course, further challenging questions to pursue, and Matt Flannagan and I attempt to tackle a number of these in our coauthored book. But perhaps another question here--one concerning Hebrews 11:31, which refers to how Rahab the harlot "did not perish along with those who were disobedient." Do you think the author of Hebrews believes that the battle against Jericho was divinely commissioned and thus morally justified? Thanks for bearing with me. Quick answer: No, I do not. Given the context of the central point the author of Hebrews is making in this chapter as well as in the following chapter, I would say it is clear that he absolutely is not trying to make the point that killing in God's name is morally justifiable, and in fact he is making the opposite point: The point of the entire chapter is encouraging believers who are suffering violent persecution not to resort to violence in their defense but to endure suffering in faith. It's important to read things in context, and not just pick verses out of context to try to make them say things the author clearly never intended. That's a core tenant of sound exegesis. I'd be interested in hearing your response to what I said above about ethics and how we need to go beyond justifying hurtful things (whether that's lethal force, divorce, or what-have-you) and towards the higher goal of restoration. Derek and Paul: I think many could benefit if you had a Book in you together about this matter where you each address pertinent questions related to this subject matter. I sense you both are on opposite sides when it comes to how we should view Scriptures. The writers (and editors) either had perfect views of God or sometimes less than perfect views of God because of influences when they wrote. Challenges arise for either view. I am convinced readers are desperate for scholars, etc. who can demonstrate how differences don’t have to divide. Thanks for the encouragement. Conversation is certainly good, and I very much appreciate Paul's willingness to engage with me here. Could you share some of the pertinent questions that you would be interested in having us address? Sure Derek. These are questions that come to mind initially. My bias will likely show in terms of how I phrase the questions. 1. Does how one interpret difficult OT passages depend on their view if the biblical authors/editors spoke for God exactly as God intended or sometimes had less than perfect views of God? Or is there another perspective an interpreter might have? 2. If Scriptures are infallible or the writers represented God perfectly, how did God make that happen without actually dictating verbally the words to the writers or controlling the writer’s thoughts? 3. If Scriptures weren’t always inspired by God to be correct representations of God, does this indicate Paul and other NT writers may not always have correct views of God? 4. Matthew 5:48 says be perfect like God. Our gut tells us we are on the right track imitating God. So, isn’t moral perfection the same for God and humans or is there anything God can do morally that would be wrong for humans to do? 5. It seems not all people died as a result of God’s orders to kills all in certain battles. So, were the Israelites disobedient by not finishing the job? If any left alive in the heat of battle, were they suppose to go back and kill them? 6. If interpretations can’t be infallible since scholars differ on the meaning of the same passages, how can we best determine what God is like? Thanks, Derek. I wouldn't say the author of Hebrews is making the "opposite point"--particularly in light of the comments a few verses later: by faith God's people "conquered kingdoms, . . . became mighty in war, put foreign armies to flight." It leads me to believe that I'm not at all taking 11:31 out of context. While God uses flawed human beings like Samson and Jephthah, their trust in the Lord to defeat Israel's oppressors is of a different order than endorsing acts of, say, sexual immorality "by faith." Could you imagine the author of Hebrews explicitly saying, "By faith, even though his life was under threat, Samson risked spending the night with a prostitute?" True, there is a new people of God who are the interethnic body of Christ--no longer a national entity with civil laws, national enemies, etc. So taking up the sword to rise up against their Roman persecutors in the name of Christ to would be misdirected. The question of taking up the sword in ancient Israel is of a different order than the plight of the new covenant people of God addressed in Hebrews. As for your other question, of course, a broader ethical discussion must go beyond justifying difficult moral exceptions. But that isn't the specific point that Matt Flannagan and I are tackling in our coauthored book. We are addressing a specific moral difficulty, and we do go into great detail about the matter of divine commands. In that setting, we raise the question, "Is taking innocent human life ever morally justifiable?" We give, I think, plausible examples (e.g., in the case of an ectopic pregnancy) that lead us to conclude that while it is an objective prima facie duty not to take innocent human life, it would not be morally absolute. (We point out too that this view is not idiosyncratic but is fairly widely accepted.) Issues of hyperbole in ancient Near Eastern war texts, etc. aside, could it be that under certain less-than-ideal conditions, that an all-wise, all-good God might have overriding reasons for issuing these difficult commands? “Neither Testament is uneasy about the fact that Israel once was a nation or a state and as such was involved in war making, or (in particular) about Joshua’s action against the Canaanites (see Acts 7 [and 13] and Heb 11)"--even though this is a problem for our modern, post-Enlightenment age. Just a few quick comments/reflections. Thanks for the ongoing conversation. Blessings to you! The novel "The Shack" seems to make the opposite point to my earlier comment: humans must surrender their right to judge good and evil on their own terms. Also it comes out against asking what would Jesus do: "Good intentions, bad idea" and explains that Jesus life is not meant to be an example to copy: "Being my follower is not trying to 'be like Jesus', it means for your independence to be killed". Have you read the book by any chance? If so, do you think it conflicts with your hermeneutic or am I misunderstanding what the author was driving at? I have not read the Shack, so I'm afraid I cannot say. Hi Derek, thanks for your response. Overall I would recommend the Shack. I think introducing theological concepts by way of story is a powerful way to reach out to those who would otherwise switch off when reading something more academic. Even for those comfortable reading academic works, the novel makes for thought provoking and entertaining reading. Derek, you are a class act. I agree Lewis. 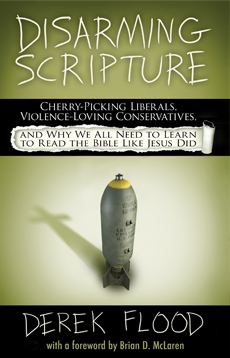 I have benefitted greatly from reading Derek’s book DISARMING SCRIPTURE. I am not sure why - maybe it has - Derek’s “faithful questioning versus unquestioning obedience” hermeneutic hasn’t received more attention. It seems required since literature requires human interpretation anyway.